First Line: The astringent December sunlight looked, as always at this time of year, like it had been ladled into the smog with a teaspoon, like vinegar. Sooner or later, the IMF (Impossible Missions Force) is going to make burglar extraordinaire Junior Bender an official member. This time Junior has been forced to accept a job by a thoroughly nasty Russian mobster whom he refers to as "Vlad." Vlad is the owner of Edgerton Mall, a rundown shopping center past its sell-by date that is experiencing a monumental holiday shoplifting problem. Junior is no lover of Christmas. He has his reasons. 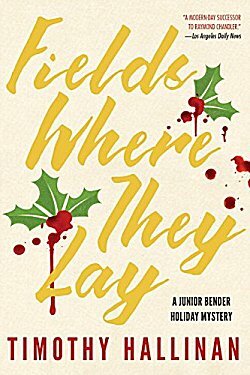 A shopping mall is the absolute last place he wants to be during this time of year, but Vlad has given him an offer he can't refuse-- and with two dead bodies shortly after Junior begins investigating, it's obvious to Junior that there's something more going on than some shoplifting. Amongst the enlightening legends and lore of shopping malls, Timothy Hallinan peoples Fields Where They Lay (as he usually does) with a first-rate cast of characters. Junior is a thief with a heart of gold. A man who stumbled into investigating cases for various Los Angeles area bad guys, and now couldn't stumble his way back out no matter how hard he tried. (It's LA's organized crime version of type casting.) Junior gets along with his ex-wife, adores his teenage daughter, and has fallen totally for Ronnie, a woman with a past she refuses to talk about. Along with the series regulars, readers can get to enjoy the denizens of Edgerton Mall, like Shlomo, one of the mall's two Santas, and Bonnie, a store owner who's never met a porcelain figurine she didn't like. Woven into the tapestry of characters and interactions, there's Junior's dislike of Christmas-- and why he feels that way. There's a lot of shady goings-on in that decrepit mall, and it's fun to watch Junior sort through it all. He's the absolute best character I know when it comes to thinking on your feet in dangerous situations. This man is a master at hiding and nano-second escapes. Love it! Is Junior going to figure out what's going on at Edgerton Mall? Is he going to be successful in carrying out a small job for Santa Shlomo (my favorite part of the book)? Will he get his Christmas shopping done? Can he avoid a personal crisis with Ronnie? How's Junior going to survive Christmas Eve at the Edgerton Mall? You're going to love finding out! To me, it's amazing that Hallinan can write two such different, but such well-done, series, Cathy. And both are well wroth reading. I really admire his skill. I went to see him last night at The Poisoned Pen, and he told us that he doesn't particularly like this book-- even though it's received starred reviews everywhere! I just reserved this at the library after reading about it in an email newsletter. Looking forward to it! Love Junior - need to find this one. I have a friend who loves Poke and can't stand Junior. I love 'em both. Go figure!